We need visibility on the traffic coming into our LAN. We have a network monitor device that we want to send copies of the frames to. SPAN ports allow you to mirror a port to another one so you can capture unicast data on the side. In span you define the source and destination ports, the source being the original port you want to clone. You can choose to copy ingress, egress or both. Remote SPAN – The source and destination ports are not on the same switch. Remote SPAN requires a trunk since RSPAN traffic is on a different vlan. There’s a third type of span called ERSPAN (enhanced). Encapsulating frames into GRE then IP so it can be routed to a destination. The CCNP doesn’t get into this. One or more directions tx, rx, or both. A port identified as a SPAN Destination has other features on it disabled. The port won’t be able to be used for any type of data or transmit. The only thing that happens is frames are copied and sent to this port. The show int shows as monitoring. The LED lights on the switch show the port as up. Don’t forget to confirm the trunk settings allow vlan 300. 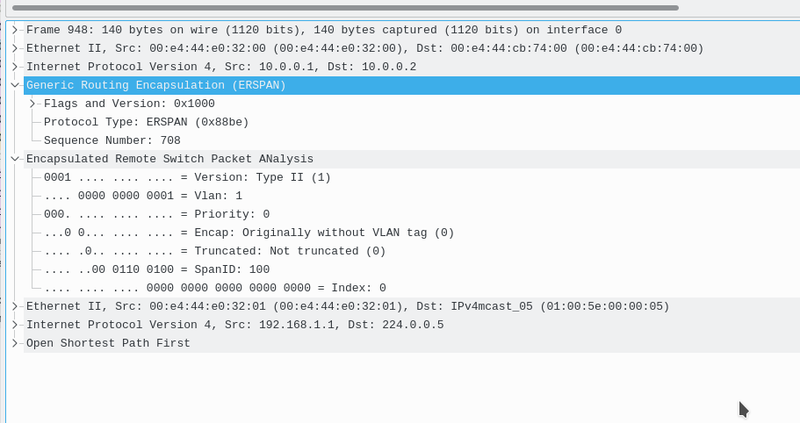 Rspan is very similar in config to span except now you would configure a vlan as your remote-vlan. 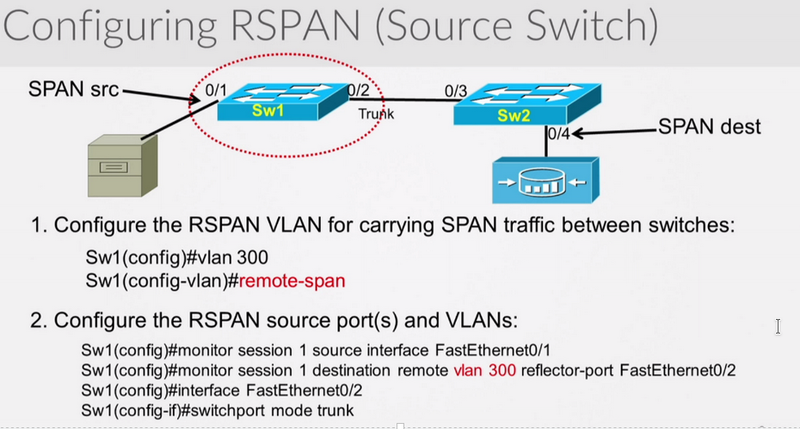 You would then configure your trunk on both switches so that the rspan vlan can traverse it. Then finally in the span config, instead of a physical interface, you choose remote vlan. Sometimes the reflector-port keyword/parameter isn’t needed depending on your switch. Your reflector-port is NOT the trunk port. The reflector port is responsible for copying the span traffic onto the rspan vlan. The reflector port should not be the trunk port. It becomes unusable. It is a way of donating asics to the cause of rspan. You should choose a port that is not being used. VTP does work with the RSPAN vlan, it will propogate it to all switches assuming it was created on the VTP server. If it wasn’t you will have to manually configure it along the path. VTP prunning will also prune the RSPAN vlan if there are no ports in that vlan. Remember ports in different vlans can be source ports, and so can trunk ports. A port-channel can also be a source port. 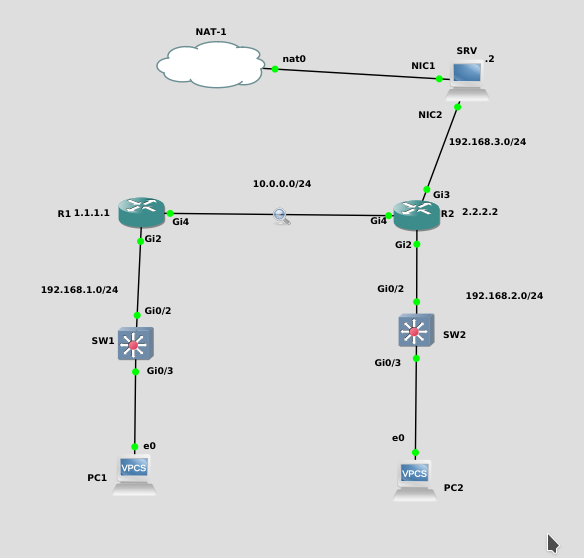 Here is the most common way to do this, and the supported Cisco way. Basically send the GRE encapsulated SPAN session to R2, who then sends it out to G3. Now you will notice that all traffic from interfaceG2 on R1 is encapsulated in GRE, and sent over to 10.0.0.2 (R2). When the packets are passed to int g3, they go out normally, decapsulated. However in the middle, between R1 and R2, during the SPAN Session, we can capture the GRE tunnel. here is an ERSPAN session where R1 sends the packets encapsulated in GRE to the PC of 192.168.3.2 WITHOUT using R2. Note that this traffic is NOT decapsulated, and thus you will see the GRE headers within wireshark on the client.